See Makati's fascinating history through old photos. (SPOT.ph) It's probably where you work now or once worked, or you're there every weekend with family and friends to do a bit of shopping. 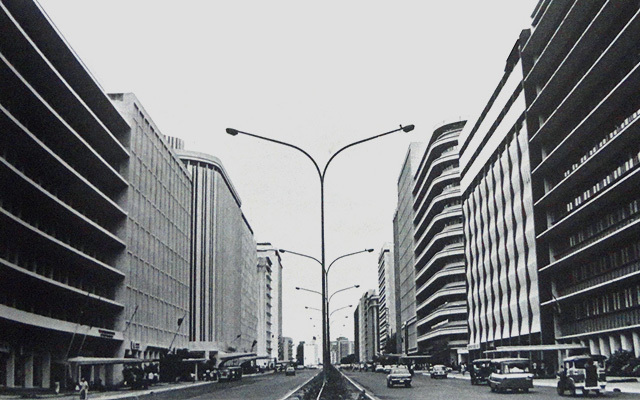 But do you know how Makati looked back in the day? While it gives you a headache for confusing parking spaces (or lack thereof) and endless bumper-to-bumper traffic, there was once a time when there was almost nothing but a few tall buildings and calesas. 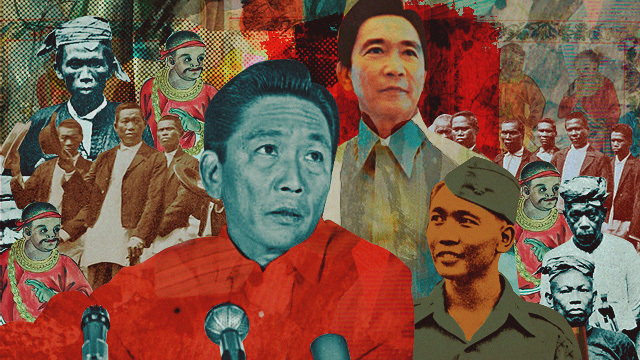 Read on to find out more about the origins of the city of Makati and its surrounding areas. The Pasig River flows beside the 17th Century settlement of San Pedro de Makati. The old Guadalupe Church, completed in 1630, can be seen on the right. Before the Spanish friars came, the swamp that would become Makati was ruled by a native chief called Lakan Tagkan. In 1570, it was turned into a visita called Sta. Ana de Sapa by the Franciscans. The cogon-ridden land is said to have derived its name either from the ebbing tide (“kati”) at its northern portion bordered by the Pasig River or by the itch-causing lipang kalabaw plant that also grew there. “San Pedro de Macati” or "Sanpiro," as the natives called their land, was later bought by Capitan Pedro de Brito and donated to the Jesuits who turned it into a Manila pueblo. After the Jesuits’ expulsion, the ownership changed hands until in 1851, Don Jose Bonifacio Roxas—the founding father of the Roxas-Ayala-Zobel clan—acquired the estate. One of Don Jose's descendants, Enrique Zobel de Ayala, established a ceramic factory there, which operated from 1903 to 1911. In 1914, the name “Makati” became official through a Philippine legislative act. 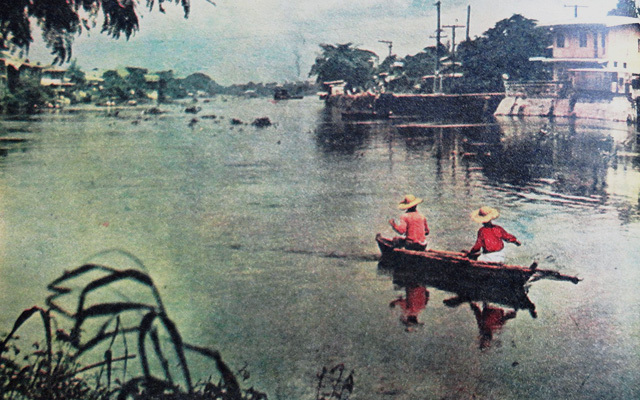 The Pasig River separates Mandaluyong (right) from fast-growing Makati, as seen in this photo from 1962. The great Pasig River runs through the hems of both Makati and Mandaluyong, serving both as a common boundary, and providing a means of transport for the industries on its banks. 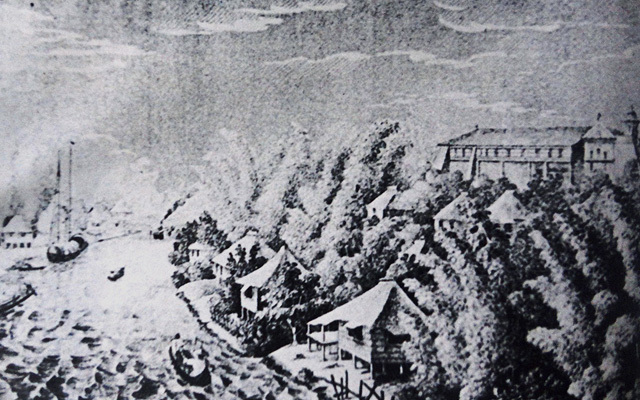 It was only after World War I that the Ayalas began subdividing Makati and developing it. Steered by municipal president Nicanor Garcia, Makati became a first-class municipality as water and electric supply became available, and buildings were erected, including its municipio, a hospital, a racetrack, and even a dance hall. But it was the visionary Col. Joseph R. McMicking, a Roxas-Zobel-Ayala in-law, who planned the amazing transformation of Makati after World War II, guided by modern urban planning principles. 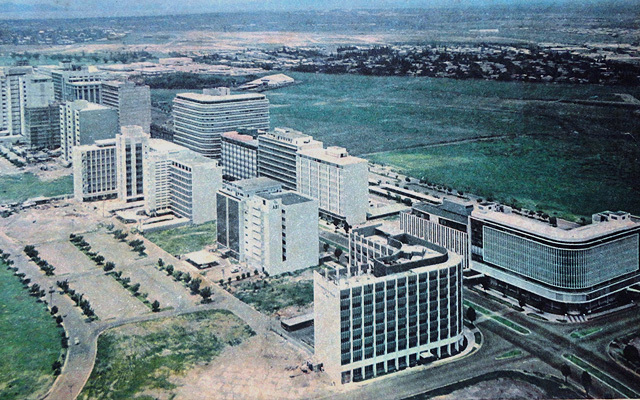 The view from the top, taken in 1966, showing Ayala Avenue lined with high-rise office buildings such as Comtrust, Metrobank, Elizalde Building, and Rufino Building. Behind and beyond are still tracts of land that would be turned into more roads, more commercial establishments, and condominium buildings. Before and after the war, Manila’s financial centers included Binondo, Escolta, and Rizal Avenue. The Ayalas saw an opportunity not only to declog the old business hubs and create jobs, but also to create a modern, ideal industrial center that will put a premium on time, accessibility, and convenience in the workplace. Ayala Corporation embarked on a 25-year development plan, which enforced standards for all lot and building purchases—for example, buildings should be at least six stories high, must have elevators and centralized air-conditioning, with a percentage of their lot devoted to parking. The first high-rise buildings began to appear in Ayala in the 1960s, beginning with the Makati Stock Exchange, designed by Leandro V. Locsin. By the late 1960s, Makati had risen to become the financial capital of the country, as Manila fell into urban stagnation. It finally became a city on February 4, 1995. Today, the Makati Central Business District continues to be the country’s premier financial and business center, managed by the Makati Commercial Estates Association and the Ayala Property Management Corporation. The Wall Street of the Philippines, as seen in 1975. The 1.9-kilometer Ayala Avenue has been dubbed the Philippines’ Wall Street, but in the '70s and '80s, it also earned the nickname, “Madison Avenue of the Philippines,” owing to the concentration of large multinational and local advertising agencies holding office there. This busy, major thoroughfare cuts through the center of the Makati Central Business District (Makati CBD) and is linked with another main avenue—EDSA. The Paseo de Roxas to Makati Avenue section was once a runway of the pioneer Nielson Airport, which was restored after the war, but converted into a road in 1949. Ayala Avenue is lined with landmark buildings like Insular Life Building, Rufino Building, Bank of the Philippines Islands, Vicente Madrigal Building, Manila Peninsula, and PBCom Tower, the country’s tallest commercial building. The old Makati Municipio, built during the term of pre-war Mayor Nicanor Garcia, as it appears in 1955. Today, it is the Museo ng Makati. 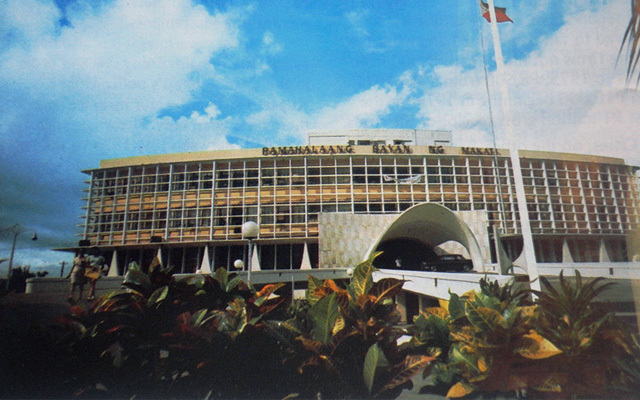 The Modern Makati Municipal Hall, completed in 1962, during the term of Mayor Maximo Estrella. A 22-storey building would be built behind it in 2000. The first municipal building of Makati was constructed originally in the bahay-na-bato style in 1918, along J.P. Rizal Street. Under the term of Mayor Nicanor F. Garcia, the municipio was rebuilt in 1934, resulting in the concrete structure that we know today. It was again renovated in 1958 by Mayor Maximo Estrella, until 1961, when the local government began its move to the modern and more expansive Makati Municipal Hall, also on J.P. Rizal. The vacated municipio was used as a library and as an eye-and-ear infirmary, until it was turned into the Museo ng Makati in 1990, during Jejomar Binay’s term. By 2000, a 22-storey Makati City Hall building was erected behind the circa 1962 municipal building. As if this was not enough, a 12-storey building—the Makati City Hall Building II—began construction in 2012 to serve parking needs and provide more office space. The controversial edifice, which is said to be overpriced, resulted in the filing of graft charges against Mayor Junjun Binay Jr. and his dismissal from public service. Under the bridge—to Makati. 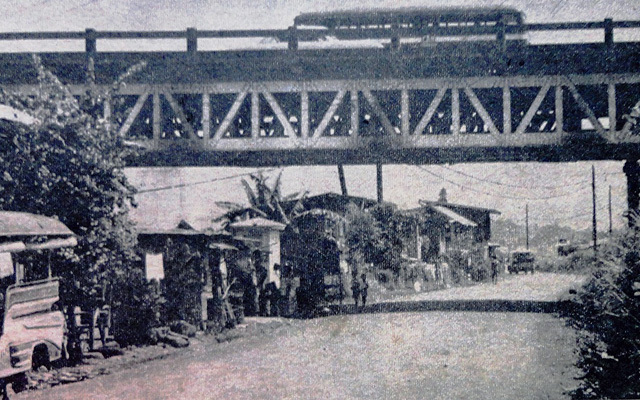 In the '60s, a dirt road under the old and rickety Guadalupe Bridge leads to Makati Poblacion, via J.P. Rizal. The road under the Guadalupe Bridge on EDSA leads to Guadalupe and Pobacion in Makati. The replacement of the narrow bridge began in 1963, during Macapagal’s term, but only 60% was finished by the end of 1965. After he assumed office on January 1, 1966, the new Secretary of Public Works and Communications Antonio Raquiza took only 70 days to complete the construction. 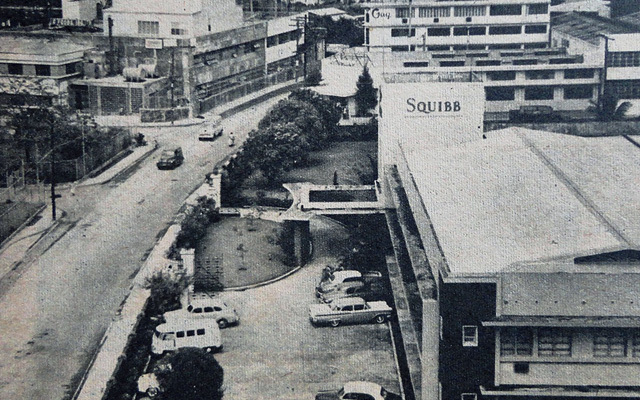 The Guadalupe Bridge, a vital Makati-Mandaluyong link, was completed on November 23, 1966. 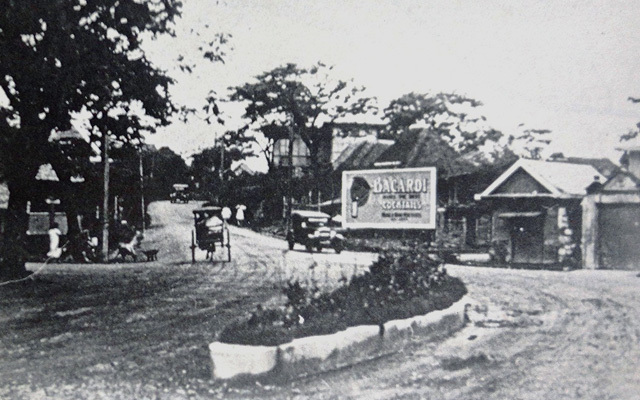 J.P. Rizal Street, the major thoroughfare of old Makati, in 1926. 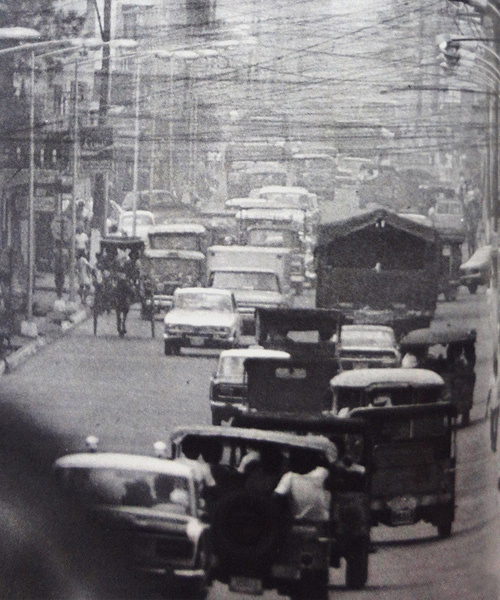 J.P. Rizal Street, with more hustle and bustle of traffic, in 1975. The main thoroughfare of old Makati is located on the southern bank of Pasig River and runs from east to west, from West Rembo to Zobel Roxas Street. The avenue—which used to be called J.P. Rizal Street—continues west through Guadalupe Nuevo (where the Guadalupe MRT Station is) then crosses under the Guadalupe Bridge—EDSA, all the way to Rockwell Center and Poblacion. After crossing Makati Avenue, the road leads to Chino Roces Avenue in Olympia, then goes past Pasong Tirad, terminating at Zobel Roxas Street, close to the border of Manila’s Sta. Ana. The old J.P. Rizal Street was once filled with calesas. Inaugurated in 1950, the club was designed by National Artist for Architecture, Pablo Antonio. Price of admission today ranges from a share price of P12.5 to 13.3 million. Now called the Manila Golf and Country Club, the private membership club has a share price that can go over P25 million, monthly dues not included. Philippine Gov. Gen. Cameron Forbes not only gave us the famous Manila Carnival, but also made polo popular, a game which he avidly played. This gave rise to the foundation of the Manila Polo Club on Calle Real (now M.H. 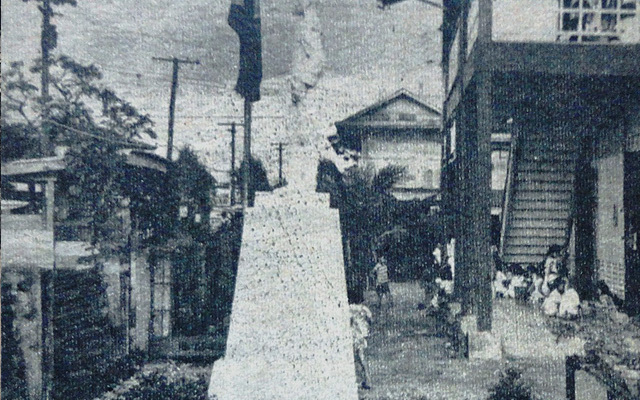 del Pilar Street), Pasay, on land donated by Forbes to members, on November 27, 1909. 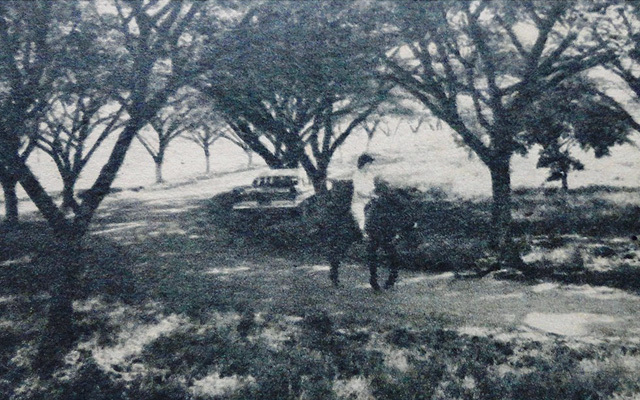 The polo club was totally destroyed during World War II, and a new location for the club was offered by the Ayala Corporation—25 hectares of Makati land on McKinley Road, for P400,000. 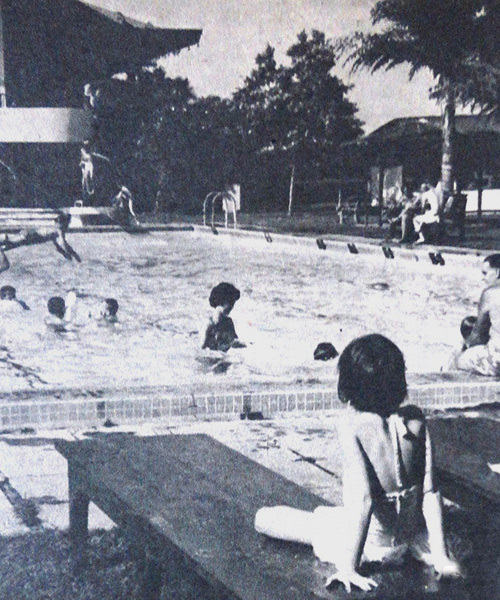 A new Manila Polo Club was thus built on July 4, 1949 at a cost of P1.8 million, complete with polo playing fields, sports pavilions, a swimming pool, various playing courts, as well as banquet and function rooms. It was also the same year that the Manila Golf Club, founded in 1901, was transferred to Makati, from its original Caloocan location. After the War, the club managed to find 44 hectares of land next to Fort William McKinley, where eventually, a new course was built. 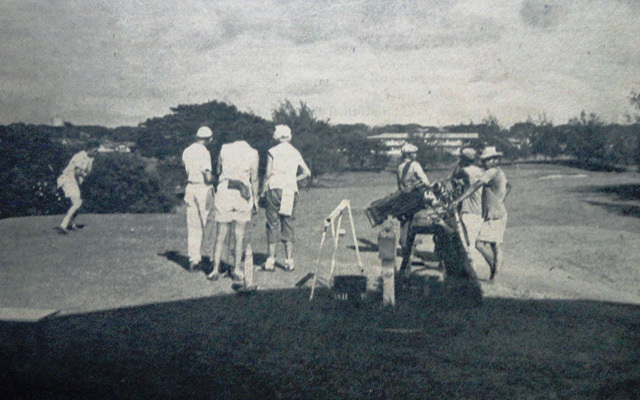 Both the Manila Polo Club and the Manila Golf Club (now known as Manila Golf and Country Club) succeeded in luring many affluent members of Philippine society to Makati. San Lorenzo Village, which opened in 1952, was a more compact, closely knit community. The gate has a checkpoint that was a village project. 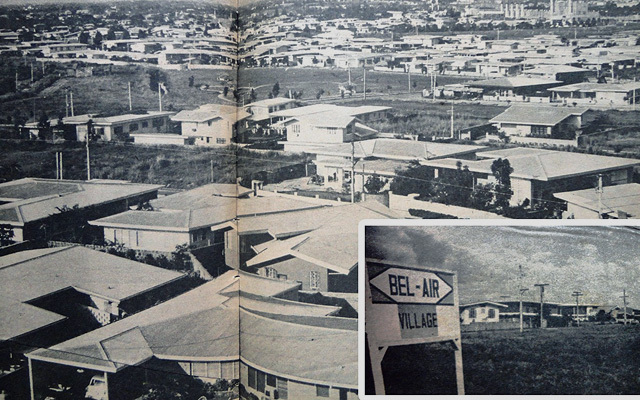 Bel-Air Village was built in 1954, mainly due to a request from pilots of Philippine Airlines. Selling began at P15 per square meter for member pilots and P30 for others. New subdivisions were carved out adjacent to the elite clubs beginning in February 1948. 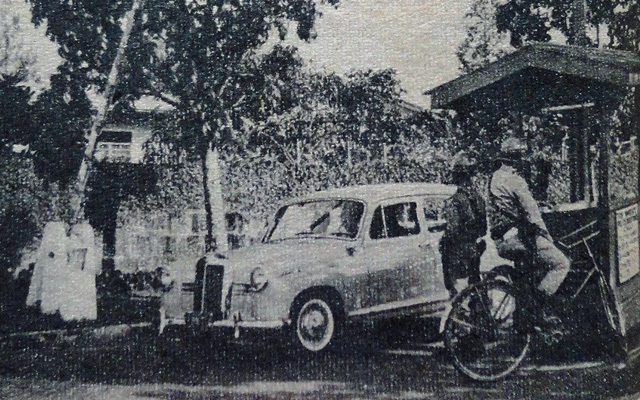 By 1949, Forbes Park was briskly selling its lots. 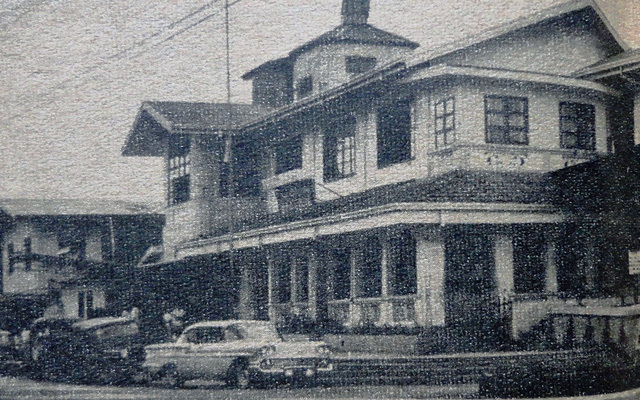 Construction of grand residential houses began shortly on Makati’s “Millionaire’s Row.” In 1952, under Ayala’s chief zone planner Col. Jaime Velasquez, an ambitious design to develop Makati into a self-sufficient community gave rise to more residential Villages—San Lorenzo (1952), Bel-Air (1954), Urdaneta (1957), San Miguel (1960), and Dasmariñas Village (1962)—as Ayala continued to build more streets, modern facilities such as a sewage plant, deep wells, and water reservoirs. The South Superhighway-Buendia Overpass (top) and the multi-storey Magallanes Interchange (bottom), were meant to facilitate travel to Southern Luzon. 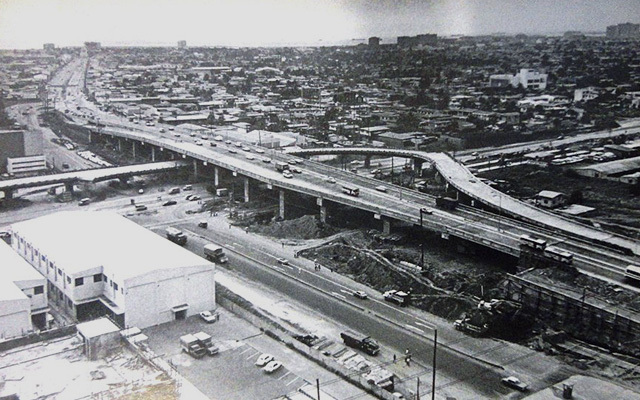 This picture, taken in late 1973, shows the Magallanes Interchange still in construction. South Superhighway (now known as South Luzon Expressway or SLEX) replaced the old Manila South Diversion Road in the 1960s which travelers and commuters used going to South Luzon provinces. The Osmeña Highway segment of the South Superhighway crosses Vito Cruz and Zobel Roxas Streets, then ascends and climbs over to pass above Buendia Avenue (now Gil Puyat) through the Buendia Flyover, with service roads to traverse that avenue and several side streets. The Magallanes Interchange, which was conceived in 1969 and opened in 1975, was one of the first structures of its kind in the country. It was only in 1995 that the Skyway was built, rising above the Magallanes Interchange and returning to its original level after EDSA. Rizal Theater, part of the Makati Commercial Center. Considered as the plushiest theater in the country in the 1970s. 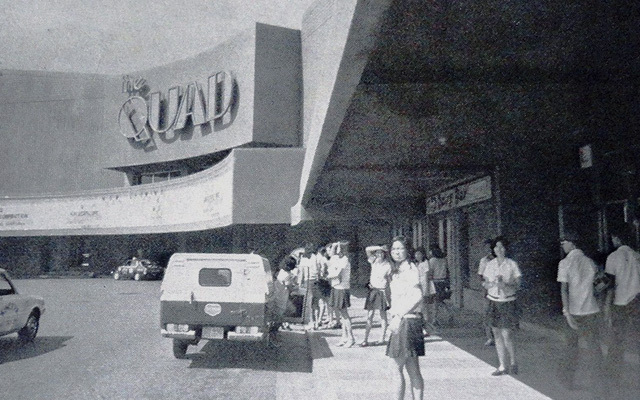 Quad Theater in 1975. The place for cinephiles, with four world-class theaters, plus a video amusement center at the basement. 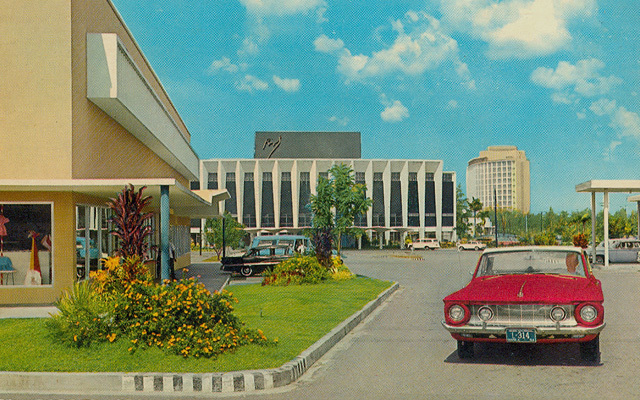 The retail commercial zone of Makati was put up in 1960, with the inauguration of the spanking new Rizal Theater. The theater was used as a venue mainly for film showing and live performances, and featured a popular restaurant and coffee shop. Rizal Theater was eventually demolished to give way to Makati Shangri-La Hotel. 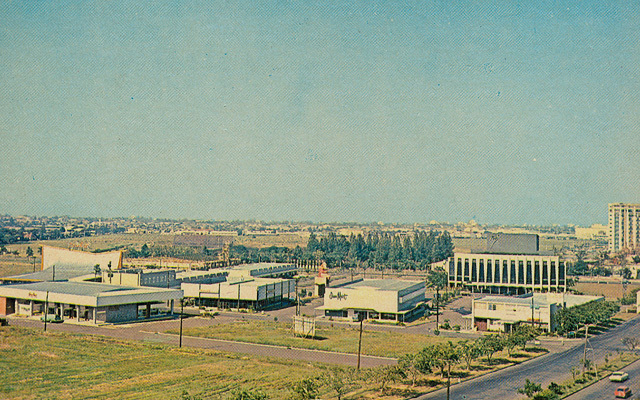 The Makati Commercial Center was rapidly filled up with business, commercial, and lifestyle shops in the 1970s. Some iconic establishments include the Quad Theater (designed by Arch. Carlos Arguelles), which had four cinemas, and an amusement center with arcade and video games, a first in the country. An outdoor Glorietta, set amidst a landscaped park designed by National Artist for Architecture, Ildefonso Santos, featured a center stage for all kinds of activities and performances. Also notable was the Rustan’s building with its trademark blue triangle mosaic façade. Landmarks that have now gone include Bricktown, Sulo Retaurant, Alemar’s, Erehwon, the Philippine Education Company, Automat Restaurant, and the Love Bus station at the back of Anson’s Arcade. Today the shopping complex is known as Ayala Center. Beginning in the 1950s, this street became the home of several commercial and light industries, as it was noted for its orderly planning in those days. Pasong Tamo Street and its extension form part of Makati’s other old commercial and industrial district, apart from Makati CBD. Its name comes from an indigenous plant called “tamo,” that once grew there in wild profusion. The 5.8-kilometer road that runs north to south from Makati (J.P. Rizal intersection) to Taguig has several sections lined with light industries and businesses as early as the 1950s till present time. 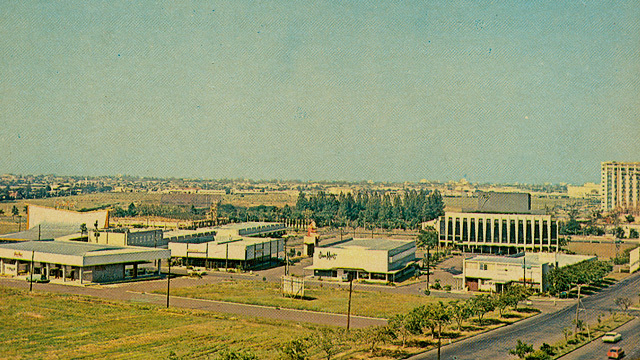 The Pasong Tamo section that bends towards Buendia was where Commonwealth Foods, maker of Café Puro, set up its factory in 1952. Another is the construction giant, Amon Trading Corporation founded by Don Aurelio Montinola in 1945. Moving southward, one can also find Don Bosco Makati, the technical school that made Makati its home in 1954. Pasong Tamo Extension, a part of Barangay Magallanes, was where longtime prime businesses established their headquarters: Bristol Myers Squibb (later, Mead Johnson), Glaxo Smith Kline, Chrysler Philippines, and Makati Hope Christian School, to name a few. One landmark in the Pasong Tamo Extension-EDSA area is Mantrade, a popular car dealership company known today as Nissan Mantrade. In the 1990s, Pasong Tamo Street was re-named Chino Roces Avenue, after freedom fighter Joaquin "Chino" Roces, journalist and founder of The Manila Times and ABC (now TV5). Pio del Pilar Elementary School, in Barangay Pio del Pilar, was known for its well-trained teaching staff in the '50s and '60s. It was named after the revolucionario who was born in Barrio Culi-Culi—now Barangay Pio del Pilar. Makati was the biggest school district in the Philippines as early as the 1960s. In 1962, for instance, Makati had over 300 elementary schools, the most well-known being the Heneral Pio del Pilar Elementary School. It had been named after revolucionario Pio del Pilar who was born in Barrio Culi-Culi, San Pedro, Makati—now known as Barangay Pio del Pilar. The original school was a two-room affair in 1911, made mostly of wood and concrete. A second Pio del Pilar Elementary School was built along Binay Street, Pasay Road (now Arnaiz Avenue) to accommodate the city’s growing population of elementary-age school kids. Makati earned an early reputation as the home of the world’s largest dance hall, with the best band music in the Orient. Opened in 1921 by an American, it was permanently closed by a typhoon less than a year after this picture was taken. The world-class dance hall that made San Pedro Makati famous opened in 1921, with American John Canson Sr. as proprietor. It was touted as the largest cabaret in the world and featured the best orchestras that played big band music as American and Filipino patrons waltzed, fox-trotted, and jitterbugged the night away. Located in Tejeros—a favorite hangout of American servicemen for its dance halls and watering holes, the Sta. Ana Cabaret was frequented even VIPs like President Manuel L. Quezon, U.S. Gov. Gen. Francis Harrison, and U.S. Gen. Douglas MacArthur. The Japanese used the hall as a military uniform and garment factory during World War II, while returning Americans converted it as a temporary hospital in 1945. 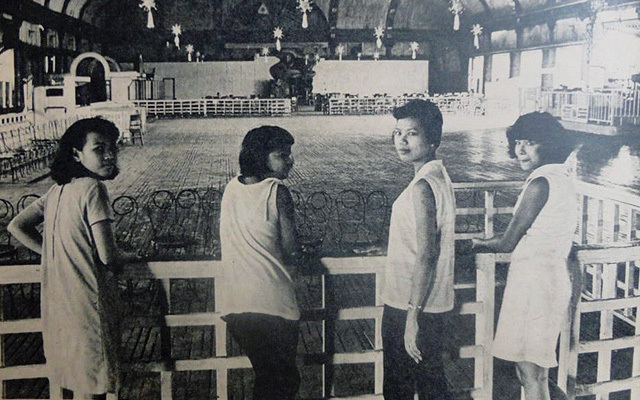 The famous dance hall stood on H. Santos Street near the Manila racing Club for 49 years, until Typhoon Yoling closed it down in 1970.